AUSTIN, Texas, Jan. 31, 2019 /PRNewswire/ -- Despite the cold temperatures outside – February deals are sure to warm the heart this month. Not only is it a great time to shower your valentine with roses and chocolate – it is also a great time to make some smart and timely purchases. Shopping and trends expert for RetailMeNot, Sara Skirboll agrees. 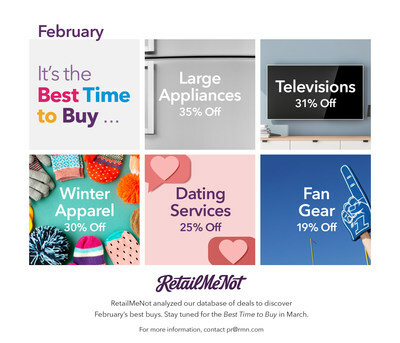 "With the biggest football game of the year, Valentine's Day and Presidents Day all happening this month, retailers will offer tremendous savings on a variety of categories. From large appliances and TVs to winter apparel and dating services, shoppers shouldn't sleep on February savings." If you've been putting off that appliance purchase, Presidents Day is a great opportunity to finally upgrade. Large items like dishwashers, washers, dryers and fridges will be deeply discounted for Presidents Day. And since it's a long weekend, shoppers will have extra time to think through their purchases and make the right selection. Smaller household appliances like kitchen gadgets and vacuums have also historically been discounted, so shoppers can get their homes in tip-top shape for the year ahead. Attention sports fans: Discounts on electronics are not strictly reserved for Black Friday! In fact, February is the second cheapest time of the year to buy a new TV. With the Super Bowl right around the corner and March Madness close behind, TV manufacturers use those big-time events to highlight big savings on big-screen sets. Another reason for the markdowns is that new models will be released in the next month, so retailers will be looking to make room for the new inventory. While some of the country is reeling from below-zero temperatures, retailers already have their sights set on spring. As they start to roll out new seasonal apparel, shoppers will find the three-day Presidents Day weekend a great opportunity to stock up on all types of winter apparel, from boots and coats to jackets and more. Life can easily get in the way of relationships, but online dating sites and convenient mobile apps are here to help, especially with spring just around the corner. Those looking for love are in luck: Dating sites can offer up to 75% off enrollment fees to encourage singles to put themselves out there. With the biggest football game of the year this weekend, pricing on sports apparel is at an all-time low. Whether you're a Patriots or a Rams fan, you can score major savings on all types of licensed team gear.